Yesterday, ESPN's Notre Dame Football Blog posted a compilation of responses to the question "What you love about Notre Dame." It got me thinking about my own reasons- and reminded me of this piece I wrote several years ago. This was written on June 23, 2004, the summer before my junior year at Notre Dame. A written explanation doesn’t do the Notre Dame football experience justice, but I’m going to try anyway. Much to my chagrin, even after two exultant years I still have people questioning my decision to attend the University of Notre Dame. This is not exactly the irreverence I may be making it sound like, as I do hail from an extremely liberal hometown, and perhaps more significantly, I am not religious. My school of choice? Definitely very conservative, and of course, very Catholic. Temporarily ignoring Notre Dame’s level of academic excellence (and let's say I could have gotten into another school at an equal level, had I applied), in my attempt to explain my devotion to my university, I credit one weekend in the fall that epitomizes one of its best qualities: the home-away-from-home family atmosphere. Many events claim to be an experience unlike any other, but until you attend a Notre Dame football game, the magnitude of such a bold statement cannot possibly be understood. A single game held at Notre Dame Stadium lasts more than just four quarters; its magic withstands an entire weekend. During the season, the campus is in full football mode no later than early Friday morning, as we have to dodge past the hordes of visitors on our way to and from our last classes of the week. The pep rallies are at 6:00 on chaotic Friday evenings, complete with motivational and occasionally humorous speeches from the head coach and a senior captain. The festivities are completed with a joyous rendition of the Notre Dame Fight Song and Alma Mater along with- as we are always reminded- the oldest marching band in the country. I remember my first pep rally just as vividly as the game itself. The JACC was filled to its brim, as it would be for each subsequent pep rally, with the upper bowl overflowing with parents and visitors while the student body dominated the rest of the arena. We were separated by residence halls, creating blocks of color around the circumference as we stood proudly in our dorm t-shirts. 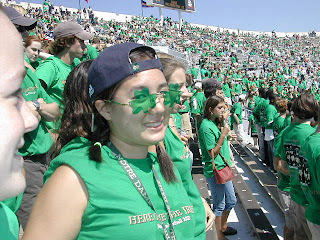 The leprechaun led the crowd through all of the cheers and motions in an attempt to make sure us freshmen would not embarrass the student section during the next day’s game, a match-up against an instate rival, the Purdue Boilermakers, in which we were going into following a 22-0 victory at Maryland the week before. Sleep came difficultly to me that night, as I could hardly contain my excitement- after all, I had never attended a non-high-school football game before. I wasn’t sure what to expect. By the time we were dragged out of bed at seven-o'clock Saturday morning by the upperclassmen who made us all go jump into a fountain, the school looked like Disneyland, but without all of the rides. The entire campus was crawling with action, with tailgating, people buying hot dogs from the multiple student-manned kiosk stations, and excited kids running around decked out in their Irish green from head to toe. By the time my friends and I successfully navigated our way to the stadium, I had probably exclaimed to them, “I have never seen anything like this!” about seventeen times. The game itself is kind of a blur to me, but a good vivacious kind of blur, as I tried to watch everything going on all around me while learning when to use all the cheers I had just learned the previous night. What I do remember is that we came away with another victory, and that I could not be happier to have had a part in it. Whether we win big or are blown out, if it is 100 degrees outside or below freezing, Notre Dame students always come early and stay until the very end, awaiting the moment after both fight songs have been played to put our arms around each other and sway together as we sing our Alma Mater. The students applaud and cheer their team no matter what the outcome in a deliciously unwavering display of support. 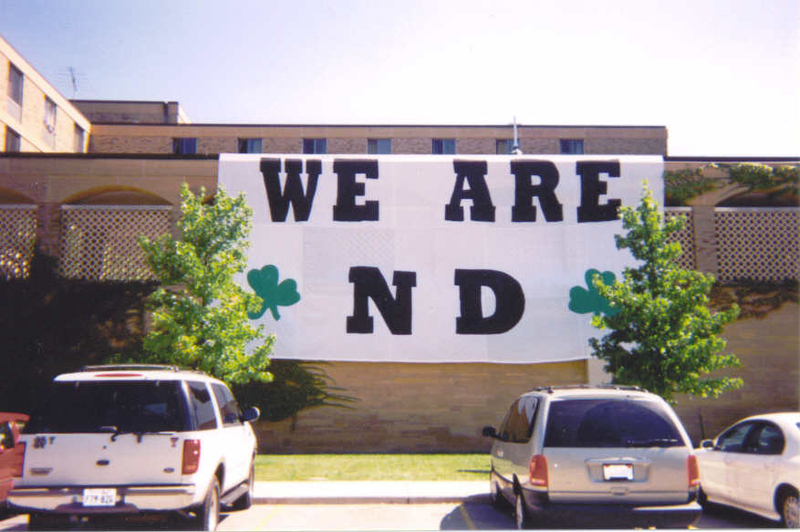 Is there a better way to demonstrate the existence of the strong, undying Notre Dame family? This is why I love Notre Dame.